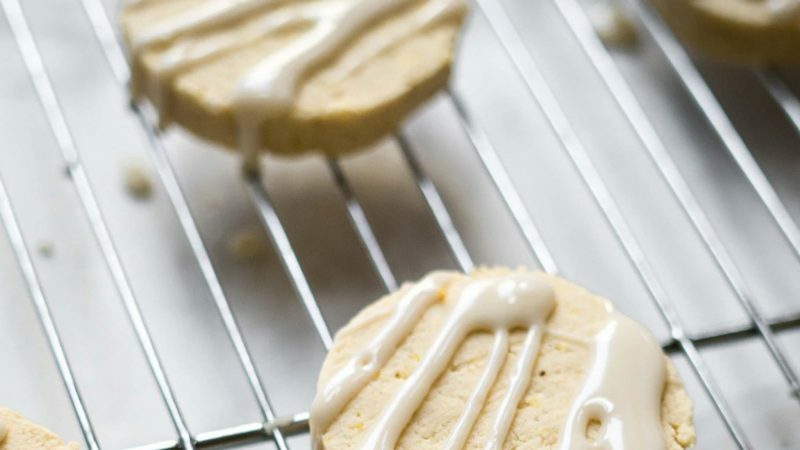 These lemon vanilla slice and bake cookies are the perfect grain-free treat – the zesty citrus glaze is a must! *NOTE: Prep time listed is hands-on time and does not include at least two hours for the dough to chill or time for the cookies to cool before glazing. To make the cookies, add the sugar and lemon zest to the bowl of your stand mixer and use your hands to combine, rubbing the mixture between your fingers to release the fragrance of the lemon zest. Add the butter. Cream the butter and lemon sugar together using the paddle attachment for 2-3 minutes. Add the vanilla bean paste, lemon extract, and egg yolk (if using) and beat until well mixed, stopping to scrape the sides of the bowl as needed. Add the cassava flour and sea salt and beat just until combined. Transfer the dough onto a piece of parchment and shape into a log about five inches long and two inches in diameter. Roll the log gently with your hands to smooth the sides, then wrap it in the parchment and refrigerate for at least two hours or up to 3-5 days. When you are ready to bake the cookies, preheat the oven to 350°F and line a baking sheet with parchment. Use a sharp knife to slice the log into round about ⅓-inch thick; you should have 12. Place them on the baking sheet at least an inch apart and bake for about 15 minutes, or until the bottoms are golden brown but the tops of the cookies are still pale. Cool for 1-2 minutes on the baking sheet, then transfer to a rack to cool completely. To make the glaze, whisk the lemon juice, powdered sugar, and salt in a small bowl until smooth. Drizzle over the cooled cookies. Let the glaze set for about 15 minutes before serving. Note: this recipe was prepared by Becky at A Calculated Whisk for Rodelle. Click here to read the original post and see more helpful tips!